Neon Glowire for your car, truck, motorcycle, or boat. 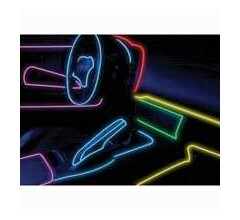 Neon Glowire is coolest way to accessorize any vehicle with neon lighting! Included in each kit is a "Music Control Module" to make the wires sound activated. The neon wires will BLINK ON when the sensor hears BASS. The sensitivity is also adjustable! This neon fiber is completely flexible so you can twist it into any shape. It's safe for indoor and outdoor use and goes anywhere you could possibly imagination! Available in 3 colors, 2 lengths of, 5-feet and 10-feet and trims to any size.Put Neon Glowire around speaker covers, sub woofers, front dash, floor mats, running boards. This is the ultimate in neon lighting for your custom car, truck, or motorcycle! Glowire can be installed using a number of different devices. You can use silicone adhesive, super glue, plastic clips or tie wraps. 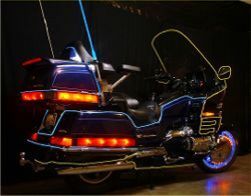 For Light Parades the wire can be draped on a motorcycle, truck or car, securing it at various points to stay in place. It can also be wrapped around antennas, luggage racks or even yourself if you ride a bike at night! Neon wire kits includes all necessary hardware and instructions for quick installation. You just need to tap into any power source! Make it turn on with your headlights, blinkers? dome lights?... anything you want! You can even get yourself a "current converter" so that you can run the wire from your home power supply 110 - 240 Volts. Neon Glowire is backed up with the PlasmaGlow Liftime Warranty! $49.99 for 10-feet of wire. International Shipping Charges will be shown at Check-Out as ""SHIPPING & HANDLING" or as "VAT" (NOTE: this is NOT Tax). Neon Glowire- Back to Home Page.